Modern day bards are being challenged to reproduce the finest works of Shakespeare in just 280 字符作為他的生日慶祝活動的一部分. 莎士比亞 37 戲劇平均約 22,500 words per play, but now organisers of his birthday celebrations are appealing for more modern versions of his works. 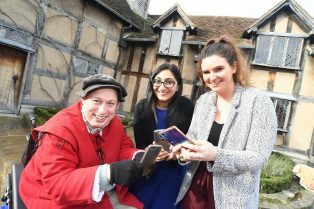 Tens of thousands of people will flock to Shakespeare’s home town of Stratford-upon-Avon on Saturday, 四月 27 和週日, 四月 28 and as part of the commemoration, organisers are looking for the best examples of his plays in a single tweet. The #280ornot280 initiative aims to see all his plays reproduced with a modern twist – and the best will be showcased during the birthday weekend for the two categories, 13-17 和 18+. The two winning entries will be featured on the Shakespeare’s Birthday Celebrations website and the 18+ category winners will receive an Afternoon Tea voucher for 2 adults and 2 children at Hathaway Tea Rooms in Stratford, 和 13-17 age group winner will receive an Explorer pass for a family of 4 which includes entry into the top Shakespeare’s England attractions in Warwickshire. 海倫 彼得斯, Chief Executive of Shakespeare’s England who help to organise and promote the celebrations, 說: “The works of Shakespeare have been studied and enjoyed for centuries and his birthday celebrations are an opportunity to look at new ways to honour his work. “Twitter is one of the world’s most popular communication tools with millions of users across the globe so we believe that this would be a perfect way to celebrate his birthday this year. “We are looking for creative ways to condense plays into 280 characters that best summarise each of his plays – and consideration will also be made for those who put a modern linguistic twist on his works. “The whole idea of #280ornot280 is for it to be fun and interactive and to get people talking about Shakespeare before, during and after this year’s birthday celebrations. Dr Anjna Chouhan, senior lecturer in Shakespeare Studies at the Shakespeare Birthplace Trust, 加入: “Since the purchase of the Birthplace in 1847, and the subsequent establishment of the Shakespeare Birthplace Trust, our mission has been to promote the enjoyment and understanding of Shakespeare’s life and works to people around the world. Geraldine Collinge, 在皇家莎士比亞劇團的活動及展覽總監, who will be putting on a host of free activities around the Birthday Celebrations, 說: “The annual Shakespeare Birthday Celebrations are a wonderful opportunity for people from Stratford and across the world to explore our town’s heritage and the life of the world’s most celebrated playwright. To submit an entry, people can either email bardbirthday@gmail.com or send it via twitter, but need to make sure to include the @Shakespearescel, by April 5, 2019.